Auto Power Off: To help save battery power, your camera automatically powers down after a certain period of inactivity. By default, the shutdown happens after 1 minute, but you can change the delay to as long as 30 minutes. You can disable auto shutdown altogether by selecting the Disable setting, but even if you do, the monitor turns off after 30 minutes. Setup Menu 2 offers more ways to customize basic operations. LCD Brightness: This option enables you to make the camera monitor brighter or darker. If you take this step, what you see on the display may not be an accurate rendition of exposure. So keeping the brightness at its default center position is a good idea unless you’re shooting in very bright or dark conditions. As an alternative, you can gauge exposure when reviewing images by displaying a Brightness histogram. 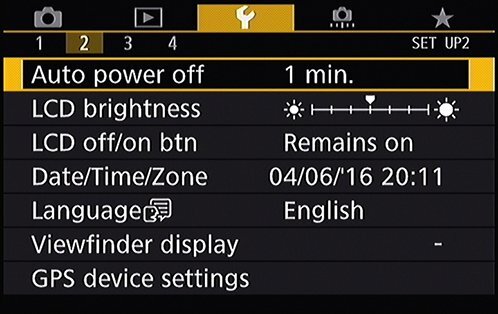 LCD Off/On BTN: By default, the Shooting Settings screen remains displayed on the monitor even if you press the shutter button halfway, and you must press the Info button to turn off the display. If you prefer to have the monitor go dark when you press the shutter button, change this setting from Remains On to Shutter Button. Date/Time/Zone: When you turn on your camera for the very first time, it automatically displays this option and asks you to set the date, time, and time zone. You also can specify whether you want the clock to update automatically to accommodate Daylight Saving Time (accomplish this via the little sun symbol). Keeping the date/time accurate is important because that information is recorded as part of the image file. In your photo browser, you can then see when you shot an image and, equally handy, search for images by the date they were taken. Language: Set the language of text displayed on the camera monitor. If you change your language (intentionally or by accident) to something freaky, you’ll appreciate the little speech bubble icon next to the Language setting for those times when you can’t read the word for Language. Viewfinder Display: Customize the viewfinder to display a grid, a level, and a flicker detection warning. GPS Device Settings: If you attach the optional GPS unit (Canon GP-E2), you can access device settings through this menu option.